Minifab 3D based in Mexico has taken to Kickstarter this week to raise the funds they need to take their new robotic bartender into production, which is capable of mixing cocktails autonomously and can be controlled by the companion application on your smartphone. 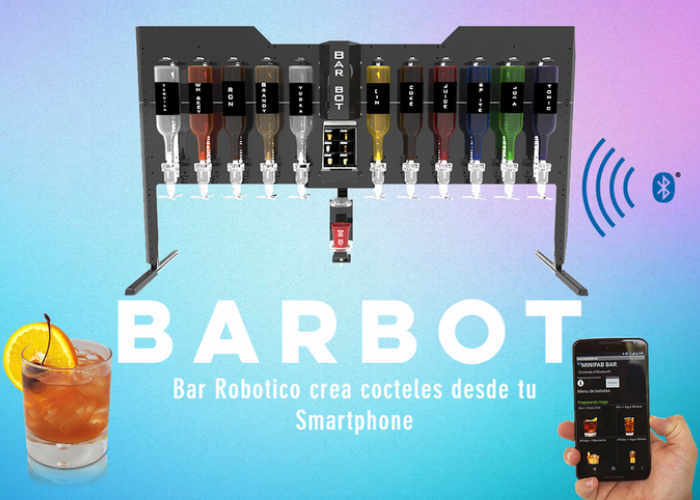 Learn more about the Barbot Bar Robotico which can be equipped with 11 different bottles of spirits, offering a wide variety of different cocktail options. Barbot! Is a Robotic Bar this team has 11 Bottles which can be varied to prepare different cocktails. Have you ever dreamed of having your own Robot that will prepare you any drink with the push of a button from the comfort of your seat? Barbot! Is a Robotic Bar that prepares cocktails automatically has dozens of drinks programmed which you can select from the APP. Not only is it an attractive Robot that will look great in any room or dining room, it is also the perfect tool for not wasting drinks at a party, be sure that drinks are perfectly prepared and control the amount of bottles consumed in your Event or party. Ideal for bars and restaurants since it prevents theft of drinks and you have control of the quantities to serve without mentioning that there is no waste or alteration in the amount of alcohol that is served. You can prepare a Shot in just 5 seconds with the perfect amount. One drink in just 15 seconds and any combination of the 11 bottles installed. You can also change the type of bottles and the type of Soft Drinks in just seconds. For more information about the robotic bartender and to make a pledge to own one of your very own with delivery expected to take place during March 2017 for earlybird backers, jump over to the Kickstarter website by following the link below.